The following sections apply only if you didn’t import yet a template in Kylo, or are lacking a Kylo template archive. You can’t import the reusable template from NiFi environment, as it has input/output ports which need to be connected. When the flow file passes through an ‘Auto terminate on failure’ relationship. In a processor in NiFi if you check the box ‘Auto terminate on failure’ and the flow file passes through this relationships and fails it will send the failure message to Kylo Operations Manager and fail the job/step. If the NiFi connection has the word ‘failure’ in it and the flow files pass through that connection. The ‘failure’ connection name will be automatically applied by NiFi if you have a ‘failure’ relationship between your two processors. 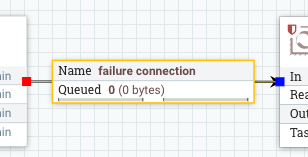 You can right click on a connection and edit it and change the name to include the word ‘failure’ if you want to always ensure that flow files which travel along that path fail the job in Kylo. Additionally if you manually ‘Empty the Queue’ in NiFi it will fail those corresponding jobs in Kylo. Data Ingest template is used to import data from with various formats (CSV, JSON, AVRO, Parquet, ORC) into Hive tables. Ensure ‘skip header’ is turned OFF. This will allow all of the JSON data in file to be processed. Otherwise the first record will be skipped. The JSON data in the file should be on one row per line. Data Transformation is used to transform/wrangle data with various operations from Spark ML. Several tables can be taken from a data source and be joined, denormalized or transformed together, to result a new data table. Repository makes it easier to register/import templates into Kylo without having to browse through the file system everytime. By default, templates from /opt/kylo/setup/data/repository/templates, coming from kylo.template.repository.default property, are displayed (see screenshot below). The default Kylo Repository is read-only and therefore templates cannot be published to this repository. 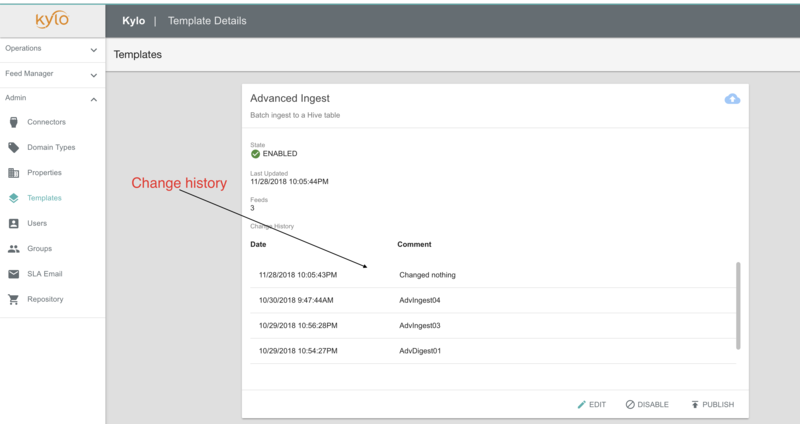 Create a new repository to publish new or modified templates. Open repositories.json under /opt/kylo/kylo-services/config folder. Add a new line between  brackets. name: Name of repository to be displayed. readOnly: Templates can be imported from this repository, but cannot be published here. location: Folder location from root with read-write access to Kylo. If not reachable, it is not displayed on UI. type: Templates or feeds will be read from filesystem. Only filesystem is supported as of now, more possibilities may be added in the future. Repeat Step 2 to add more repositories. Separate the lines by a comma. Restart kylo-services (service kylo-services restart). Click ‘Import’ to import or update the template. Open any of the registered templates. Select the repository to publish to. 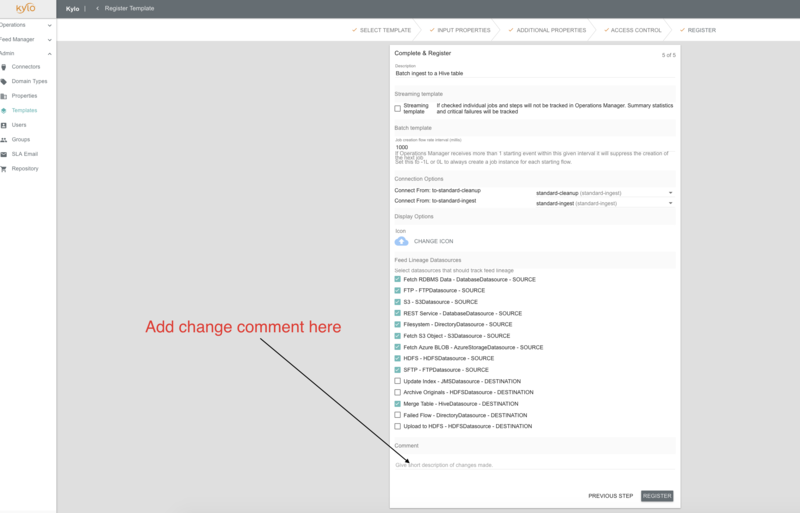 Go to Admin -> Repository and select repository from dropdown, to verify the template has been published. If the repository location in repositories.json does not exist/not reachable/readOnly=true then the repository will not be displayed in publish popup window. If a registered template is modified, you can enter a brief description of the change before saving the template. An internal cache is maintained to track template updates. In cluster mode, this cache needs to be refreshed. Add expire.repository.cache=true in application.properties to enable this cache auto refresh.